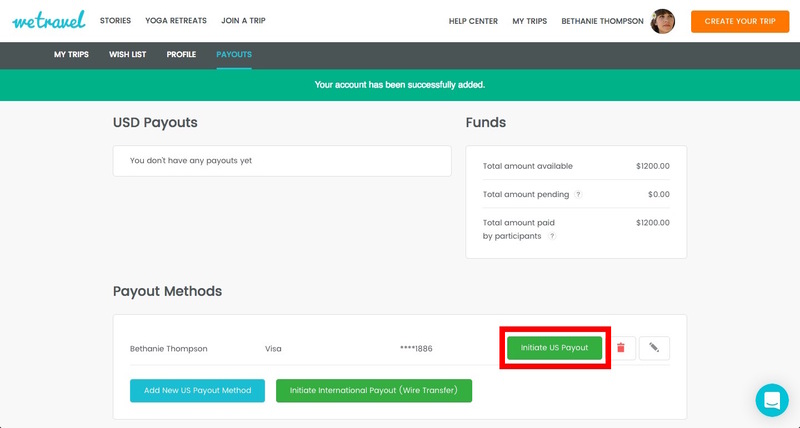 How to add your account to make USD payouts and transfer funds? You need to enter your payout details in order to transfer your collected funds. This article will first explain how to do payouts to your own personal account or your company account. Then, we discuss how to do payouts to a third party in the US, and internationally. Go to the payout page by clicking on your name in the upper right corner and selecting "Payouts". You will be prompted to choose whether the account is a personal or a company account. You will now be forwarded to a secure page of our payment provider Stripe. Stripe is one of the largest online payment processors, used by many large companies (e.g, Facebook, Lyft). You will be first asked to enter your phone number and your email. 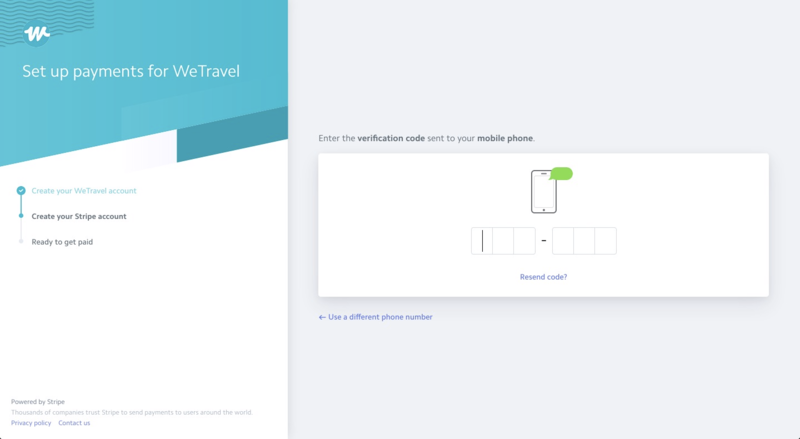 You will then receive a text message with a code to verify your phone number. In the next step, you will enter your name, date of birth and your banking details. You can enter the debit card which is linked to a bank account, or you can enter the account and routing number of the bank account. 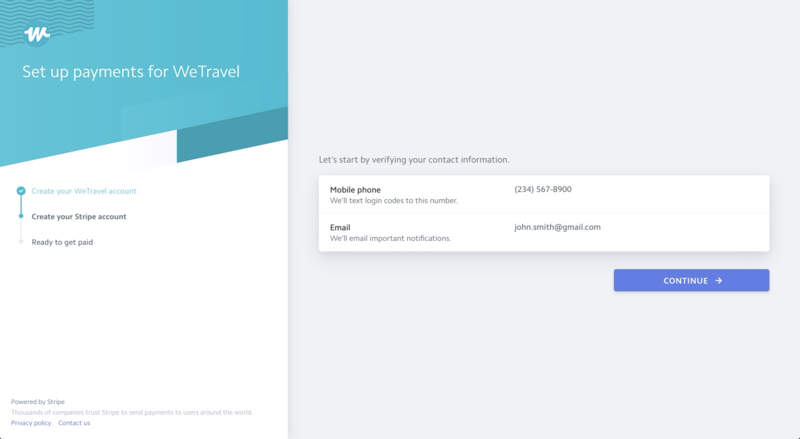 After you have entered your payment details and clicked "Create Account" you will be redirected to the WeTravel Payout page. 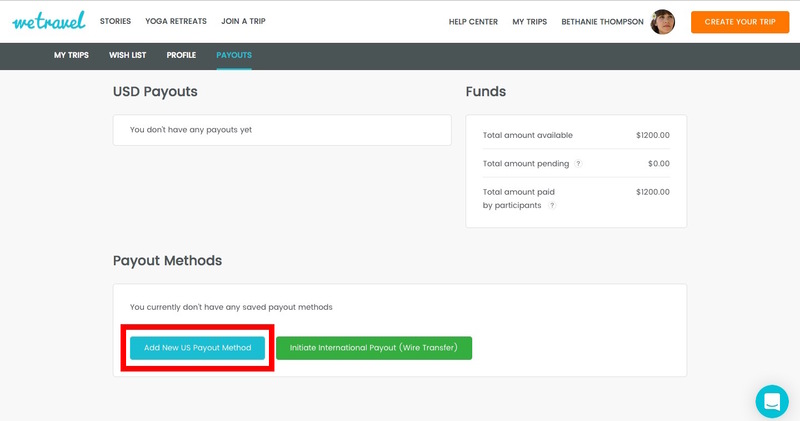 You have now added your payout method and can transfer funds by clicking on "Initiate US Payout". Payouts take 2-3 business days to arrive at the destination bank account. In the next step, you will enter your name, date of birth and your banking details. Additionally, you will have to enter your business legal name. You can enter the debit card which is linked to a bank account, or you can enter the account and routing number of the bank account. After you transfer a certain amount to your bank account (usually after a few thousand dollars), our payment provider Stripe is legally obliged to identify your identity. Verification is needed for both personal and company accounts. 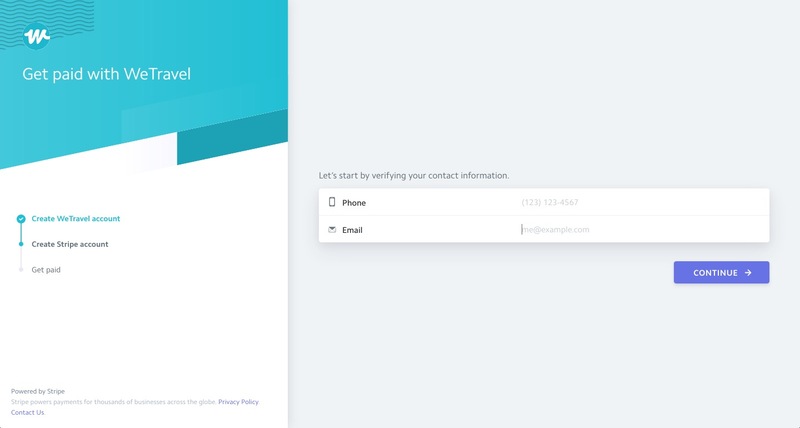 If verification is necessary, you will be contacted by Stripe via email and text messages with instructions on how to add verification details such as your address, date of birth, social security number (SSN), employer identification number (EIN) (for businesses) to the account. All of this can be done conveniently on your phone. 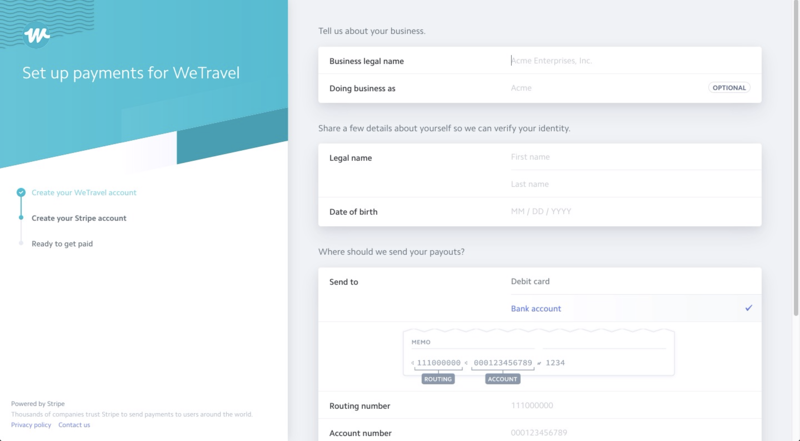 If you do not have an SSN or the automatic verification fails, you will be asked by Stripe to upload an ID document (driver's license or passport). Delay for ID verification: In some cases, this ID verification can delay your first large payout by a few days. Please keep this in mind and transfer your funds early enough. You can register and transfer funds to any US bank account, even a third party. However, keep in mind that you might need to enter additional personal details to verify the account holder if you transfer large sums to that account (see "Identity Verification" above). 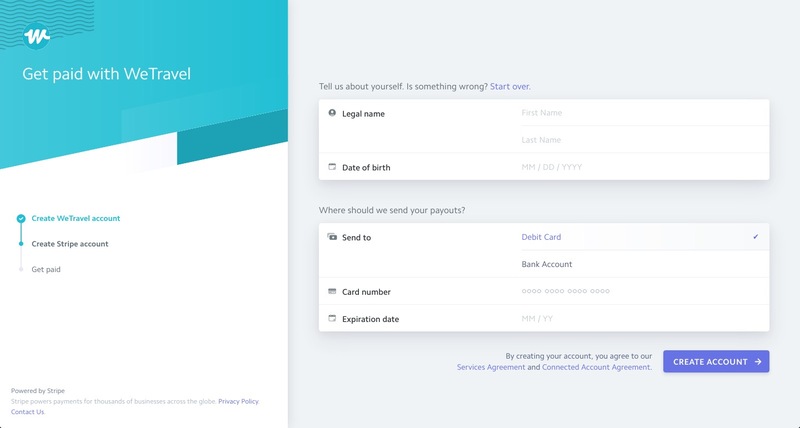 Thus, you might be asked to provide Stripe with the third party's date of birth, address, SSN and maybe a copy of their ID document. To discuss other ways to make payouts to third parties in the US, please get in touch with us. Click here for GBP, here for EUR, here for CAD, here for ZAR, and here for AUD payouts.